What better way of enjoying your Sunday then changing into your yellow trousers and pink pullover, grabbing your 3 Wood and heading onto the fairways for 18 holes? But if you don’t have that, the next best thing would be to play a simulation of it – right? Well… Nintendo clearly thought so, so in 1986 in the UK they released their take on the famous game, with the black box design, to the British masses. Does it live up to the real game? Does it make you want to be the next Bubba Watson? 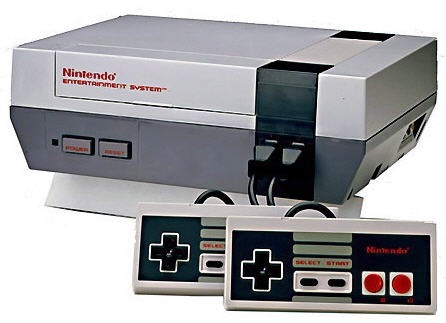 Well popping this sucker into your console provides you with a basic menu – 1 Player Stroke play (no sniggering) or if you got your buddy over and up for something more relaxing than Contra, 2 player Stroke Play. But one thing I will say, whatever takes your fancy, it goes straight into the game – no character selection, no colour coordinaton clothing, straight up gameplay. The game itself is very simple, if you don’t know the rules I suggest Wikipedia to start with – the idea of getting the ball in to the hole in the fewest hits, or “strokes”. On screen shows to the top left information on how far the hole is and your score. To the bottom left a rather portly-looking Mario, in his finest blue trousers and white polo top, that gives off the impression he’s more a builder on his day off trying to hob-nob on the green. Well they do say exectuive decisions are made on the golf course! To the right is the course map. 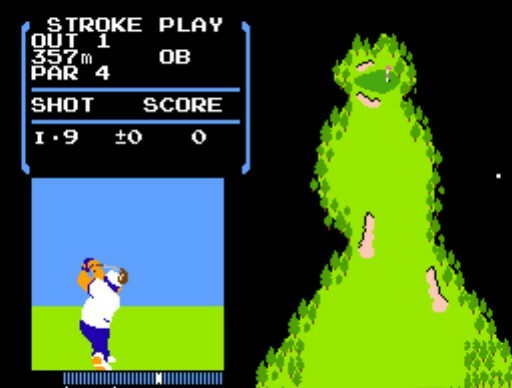 The controls is the standard for most retro golf games – press A to start the power bar, A again to set the power, and a final A to stop the bar, trying to hit the white line as accurate as possible. So far so good. Its a nice touch when you aim the ball using left or right d-pad, to adjust this and this is graphically reflected in the bottom left hand side of the screen where Portly-Mario is. But alas there is where the good times end. 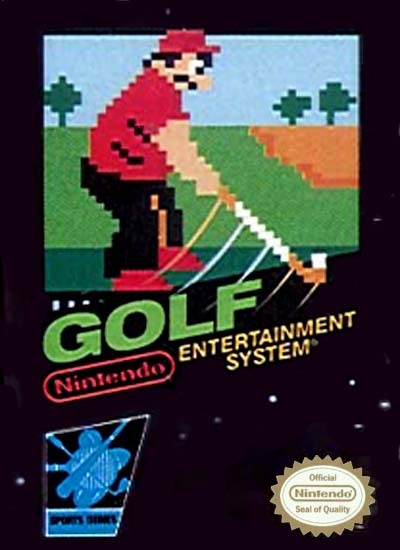 Unfortunately, as much as this game has the usual golfing fare of bunkers and wooded trees, what the game lacks is accuracy. You may know how far the ball is to the hole, however what you don’t know is how powerful your golf club, and this ultimately ruins the gameplay. For example, it shows its 120 yards to the hole, but with 13 clubs and a putter to choose from, how do you know which club to use? Without a power rating for each club, your guessing in the dark, and this a major hindrance espeicially to those who don’t know golf properly, like myself. Added to this, if you don’t know the strength of the club, you don’t know how hard to hit the ball on the power bar. This leads to you hitting the ball too hard, over the flag and hole, or too softly, causing you to use up more shots. You’d have an easier and more accurate time peeing into a tornado and dodging the spray. In terms of sounds, well, there is none. No groovy music, just you, your concentration, and the whoo sound made when you make your shot. And if there’s a more annoying sound than when you hit the ball out of the area, into the black parts, then please let me know because you’ll hear it time and time again, the *urgh urgh urgh* sound. It’ll be ingrained into your psyche, even after the console is shut off you’ll randomly hear the Out of Bounds (OB sound) in your day-to day life. Way back when, before Final Fight and Streets of Rage took the street fighting market en mass to the home, what did gamers have to satisfy their lust for violence and urge to beat seven bells out of one another? 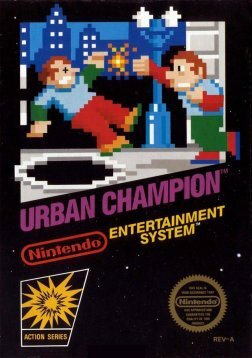 Well of course, there was Urban Champion, one of the black box launch titles on the NES, released in the UK in 1986. So how does this game fare up 26 years since its inception? Well thrusting this bad boy into the console, your treated to the main menu, with its jovial if not short theme music, provides 2 options, game mode A where its you vs the computer, or game mode B where you and your good buddy go mano y mano against each other for fighting supremecy. As for the game itself, the idea is not as per a conventional fighting sense of having a health bar, diminishing this to zero, but to knock your opponent to the other side of the screen, to which your treated to a spectacular backwards roll which I doubt you’d ever see in real life street fighting (as cool as this would be). After winning the round twice, on the 3rd time, you need to knock your opponent into the open sewer manhole, to win a jaunty confetti-rain to fall down. There’s no kicking, no headbutting, just pure unadulterated punching will do here. The A button does a light quick punch that deals your opponent moderate damage, with the B button a more powerful yet slower punch, knocking your opponent to the floor. Pressing Up plus a corresponding button does a head punch, whilst Down+a button deals a body punch, so variety ensues rather than just mashing the buttons as fast as possible. By pressing the up button provides a block to the head, whilst button down blocks opponent punches to the body. You have a timer of 99 seconds and energy of 200 points. By recieving a light punch, your character loses 4 stamina, whilst a heavy punch loses 10. But 200 is adequate enough for the level. Set against a city backdrop of lit skyscrapers, the pastel colours make the whole setting look serene, rather than a bloody duel to the manhole. You will notice the same shops in the background, from the snack shop to the discount shop to the book depository, on an endless cycle, but its nice for some differences. Although the colours and graphics are pleasant and easy on the eye, its nothing spectactular, but for the mid 1980’s coming out of a video game slump, what do you expect? Saying that, you are controlling some of the least colour-co-ordinated characters in the history of gaming, with your player fashioning a stylish blue top, green trousers and purple shoes. Its almost as if the developers wanted you to fall into sewage, the colours might then match if your covered in the waste of the cityfolk. But hey, this isn’t a critique on the style of an urban fighter, but if I was going one-on-one, purple shoes wouldn’t be my choice of footwear. So you know the aim, the controls, and the graphics, so whats the end result? Having knocked your opponent into the next screen twice, to then punch them straight into an open manhole, the cycle keeps repeating, with no designated end in sight. Once he is in the manhole, your treated to the sight of a vuluptuous blue-haired maiden upon yonder windowsill throwing confetti your way as if it were rain is a welcome way to finish the duel, but theres no romance a la Kung Fu, mores the pity. The game starts off off easy enough, knocking the opponent into the netherworld, however getting to Round 15 and beyond, you need endurance, skill, and to ensure the police don’t catch you. When that happens, both players are taken to opposite sides of the screen, looking up to the sky non-chalontly before resuming battle. Although a nice touch, with the faces drawn well for this part, it is infuritating if your about to send your opponent downtown (well to the next screen) to then be split up and start all over again, with reduced time and stamina to do this with. So all in all, how does this stack up with its other black box releases? Well, for the time, it was a good start to the fighting genre, and gave gamers the sense of beating 7 bells out of your opponent, but time has not done this game well. When this was released for the Wii’s Virtual console, amongst the reviews of this was that it was bland, boring with clunky controls and not worthy of a VC release. 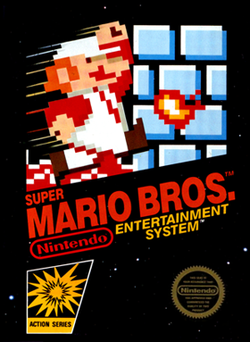 True, its not the best release on the NES, and ocmpared to today’s games, may seem slow and boring, but as with all games of its time, you have to remember this was the first of its kind on the NES, so of course it wouldn’t be perfect. As long as you take it for what it is, a basic one-on-one game with decent controls, you and your buddy will have a whale of a time. Well not a whale, more a starfish of a time. But grab a copy if you can of this, stick on the two player, and chortle as you man hurtles down a manhole, and I’m sure you won’t want to copy what you see on screen and do this outside. And on the 3rd day, came those who judged, and reviewed.